When most people think of The Villages and its hundreds of activities, they are more likely to be thinking of golf or pickleball than they are of horses. But horses, in particular, polo, is one of its most iconic sports. The Polo Center and its Pavilion let you take in an international polo match or compete in a BBQ competition. The interest in that sport, and its world class polo fields, are the result of the interest in the sport from the family that owns and developed this community. 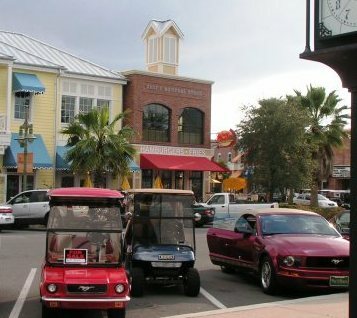 The Villages is the world’s largest active communities with 60,000 residents, with plans for 100,000.There are 2 town squares (Spanish Springs and Lake Sumter Landing) which have shopping, restaurants, and open-air plazas featuring free nightly entertainment. It is in these plazas that all the big holidays are celebrated by the residents - Cinco de Mayo, St. Patrick's Day, Halloween, etc. There are 33 golf courses, 8 country clubs (residents automatically become members), along with plenty of (separate) family and adult recreational areas. There is virtually every kind of activity and athletic resource: archery, one finger painting, pickle ball, quilting, scrap booking, synchronized swimming, taichi, yoga, etc. Ryan Erisman's "Complete Guide to the Villages". Housing choices are one of the odd things about The Villages, which betrays it roots as a manufactured home community. Although there are many styles and sizes to choose from, single family homes are the only housing choice (there are a few villas – attached homes). There are no apartments or condos. The Villages’ assisted living component, Homewood, is growing rapidly and provides long term peace of mind for residents. Homewood is across the street from The Villages Hospital, the largest medical facility in this part of Florida. Zillow lists the median home value to be $274,700 in early 2019 and called it a "Very Hot Market" at this time. If you like big, you will like the fact that The Villages is the largest active adult community in the world, and no one else is even close. Because of that size it has unparalleled opportunities for recreation and socializing. Many people liken the experience as summer camp for adults. Here you can make friends fast and enjoy many fun new pastimes. Here is a link to an interesting Youtube video about The Villages. No apartment living. The Villages' Community Development Districts are in a dispute over tax-free bonds issued to acquire golf courses, parks, and other facilities. See related Topretirements story. Homeowners often have a fractious relationship with the developer over control - the ballot box vs. the suggestion box is one way the relationship is characterized. 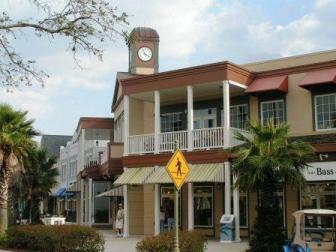 The Villages is in central Florida about 20 miles south of Ocala. Winters are warm, summers hot and humid. The Villages has countless activities and cultural events that are taking place all of the time. Anyone can participate, or you can leave it to the pros. There are hundreds of clubs and organizations from theatre to chorus and everything in between. No one could possibly take part in a fraction of what is going on here. There is very little crime in The Villages. The Villages Hospital is a well equipped facility. Interstate 75 is not far away. Two locations from The Villages operate almost non-stop shuttles to Orlando International Airport. Just about everyone uses a golf cart for their everyday transportation, many couples are 2 golf cart families.